Sacha Baron Cohen in "Borat"
The new show, entitled “Da Ali G Show,” became and instant success on UK TV in 2000 and Ali G not only became one of the country’s biggest TV stars, but also one of the nation’s most prominent icons, whether the prim and proper Brits liked it or not. Appearing every where from magazine articles to award show red carpets, the only thing Ali G hadn’t conquered was only a boat ride away. Arriving in America with millions of unprepared viewers, Ali G brought his limitless imagination to HBO for a fresh stab at humiliating Capitol Hill. Played by comedian Sacha Baron Cohen, Ali G was invented in 1998 for Channel Four’s late night satire. A graduate of Cambridge, Sacha is much different from the character he plays on screen. Originally dedicated to pursuing a PhD like the rest of his brothers, Sacha eventually turned to a career in comedy with the hopes of becoming a big-star. Appearing as two other characters – Borat and Bruno – on his unscripted show, Sacha will forever be remembered as the moronic wannabe gangster, Ali G.
An online database of Sacha's work under the Ali G persona. Starting out as only one in a cast of comedic characters for the British late night news satire, "The 11 O'Clock Show," Ali G has worked with some of the UK's funniest comedians (including "The Office" Golden Globe winner Ricky Gervais). After gaining an unexpected source of popularity, Ali G was shortly given his own show, "Da Ali G Show," which spawned three videos, the full-length film "Ali G Indahouse," a paperback ("Da Gospel According to Ali G") and a US copycat for HBO which has given a fresh start for the hip-hop commentator. A measurement of Ali G's international influence is hard to nail, but his appearance in the Madonna "Music" video is a good example of where he stands. 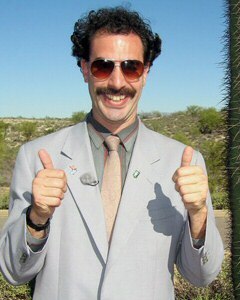 Cohen's latest comedy, "Borat," opens in theaters on November 3rd. Also, look for the comedian's resume to blossom over next few years with roles in upcoming films like "Madagascar 2," "Sweeney Todd," "Curly Oxide and Vic Thrill," and "Dinner for Schmucks." Cohen has also recently stated that his next character film will indeed feature the gay fashionista, Bruno. "It’s weird. For that time they’re in the room with me, sometimes they totally forget who they are. And they come out with a totally different side of themselves. Some try to appear cool with Ali G and down with the kids. Some want to be liked by Ali G. Boutros Boutros-Ghali kept on telling me he used to be a bit of a bully in school, and he used to muck around. They want Ali G’s approval. They’re in the room with a total idiot, and yet they’re seeking his approval. As if it somehow makes them cooler."